Reform is served. This week, Donald Tusk tabled a draft proposal for changes to the UK’s membership of the European Union. The most contentious aspect of the deal, at home and abroad, is the emergency brake stopping EU migrants claiming benefits for 4 years. Migration has dominated international debate in recent months, with the refugee crisis eliciting strong reactions. As the Syria conference was taking place in London yesterday, ComRes research showed that the attitudes of the British public have hardened against welcoming more refugees into the UK since the photos of Aylan Kurdi on a beach emerged. But long before this, migration has dominated the national debate, being routinely named one of the top concerns by the British public - and it is set to be a key component of the EU referendum campaign. With so much of the renegotiation around UK’s membership of the EU hinging on one single demand aimed at lessening the ‘pull’ factor for immigration, who do Britons think of when the press and politicians talk about migrants? Is it any foreign-born coming from outside Europe? Or within Europe? Are they still migrants if marrying a Briton? And are their kids? Ultimately, where do we draw the line? 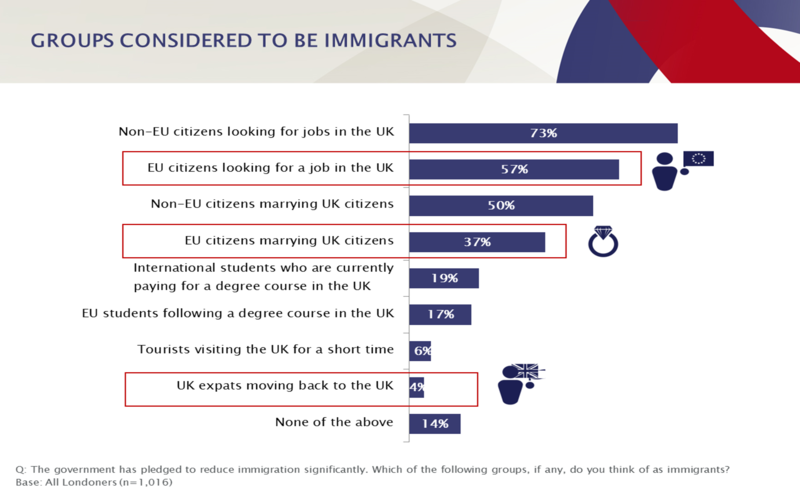 A ComRes poll of Londoners helps shed some light on this issue: while three quarters of Londoners consider a non-EU citizen coming to the UK to look for a job as a ‘migrant’, fewer than three in five label a EU national coming to the UK under the same circumstances a migrant. If it’s a EU citizen marrying a Briton, then less than two in five say that person counts as a migrant; and if it’s Britons themselves moving back to the UK, only 4% of Londoners would think of them as migrants. This is somewhat different from official definitions. The ONS considers migrants all those moving outside their usual country of residence for at least a year; under this definition, 13% of immigrants to the UK in the year to June 2015 were Britonsreturning from living abroad. And HMRC considers ‘non-UK families’ to be those where one partner is not British – even if the other, and their children, are. According an ONS estimate, this would include over 7% of UK couples – including some of our prominent politicians, such as Liberal Democrat Nick Clegg, Labour’s Stephen Kinnock, Conservative Minister Rory Stewart and UKIP leader Nigel Farage. Proposals for the emergency brake are not yet finalised, but could hit Britons who marry a EU national, and their children - not exactly the migrants that the British public often pictures. What we are seeing is a large gap between public perceptions, political rhetoric and official definitions of who a migrant is. With the EU referendum due to be dominated by concerns about immigration, it will be important for politicians to understand both what their audience understands as the definition of a migrant, and what the official statistics actually refer to.